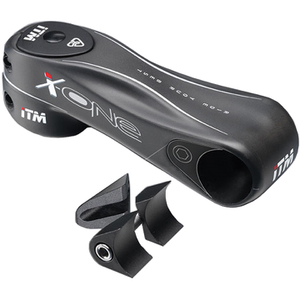 X-ONE is the new road set from ITM. Curvy with an elegant shape, the handlebars combine strength, solidity and safety to form a unique product. New Reach allows you to find the most comfortable position maintaining full control. New Bend And Drop Design allows an ergonomic grip and control of the handlebar, both in a low and maximum effort position. New Anatomical Shape allows the palm of the hand to lie naturally on the grip, and to relieve strain from arms when riding. HM carbon UD matte finishing. I've ridden a lot of different bars over the years and this is the most comfortable yet. Big hands are needed to reach brakes while in the drops. It is the best handlebar I have ever used. The shape of the handle fits the hand and the riding became comfortable. Also, I like handles with short reach, so this handle is the best. Especially bracket position is comfortable. I'm now on my 4th road bicycle. All of which were very nice bicycles, the new one being a custom built steel frame bicycle. On my last road bike (a Trek Madone) I noticed I liked the flat portion I got on a bontrager handlebars/ultegra brakes combo. I searched the web for handlebars that had nice flat portions up near the brake hoods and found these. Exactly what I was looking for! The entire top of the bar provides a nice flat area for my hands. I have more comfortable options than ever before. Really glad with my purchase in combination with ITM x-one stem. It looks great and the handling of the bar is very comfortable. The design and. Graphics looks great. Weight is good enough not too light but inline with competitor with similar integrated setup. I just came back from my first ride with my new X-One bars, and I was blown away. These things are the absolute best I have ever used for general road riding. Not only are they fairly light for an aero bar, but they are amazingly comfortable... and I was looking for bars that don't cause me grief on long rides. The shape of the bar works perfectly, no matter what the position of your hands. I rotated through five different hand positions during my 110 km test ride, and it felt perfect in each. If you buy these handlebars, I guarantee you won't be disappointed. One final comment is regarding the width. The width is measured from center to center at the bar ends, but be aware that the drops flare out slightly and the width at the brake hoods will, therefore, be about 2 cm narrower than the stated size. If it's the width at the brake hoods that you're concerned with, order one size up from what you want at the hoods (i.e. if you want 42cm at the hoods, order the 44cm bars). Great looking handlebar. Very well build with confort in mind without sacrificing aerodynamics. The best handlebar I ever had so far. 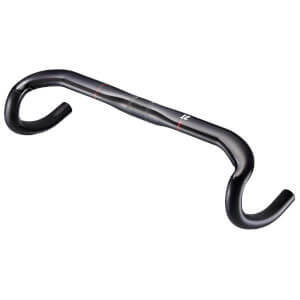 This handlebar is simply gorgeous, the shape of the tops are pretty comfortable and it has a nice drop and reach for me that I´m not quite elastic. 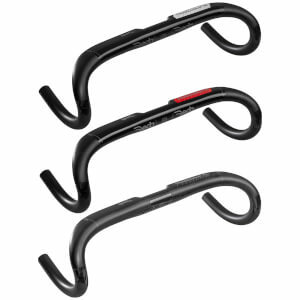 Is not the lightest handlebar on the market, but 220 gms. are not that heavy. i just wanted it would be made in Italy and not in China. 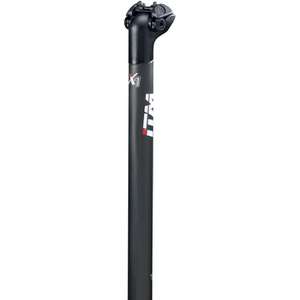 But the price is lower than similar bars from 3T and Deda. A very good purchase.